The Tenaya Mundaka draws heavily from the Oasi - the shoe worn by Alex Megos on the world's first 9a onsight - taking away none of its style and performance but making some changes. The middle part of the sole is now very soft, making the Mundaka more precise than the Oasi and with better sensitivity for overhanging problems. Don't worry though, as it's not all about the steep stuff; they've kept the toe-box nice and hard so as to not sacrifice edging power performance on the vertical. 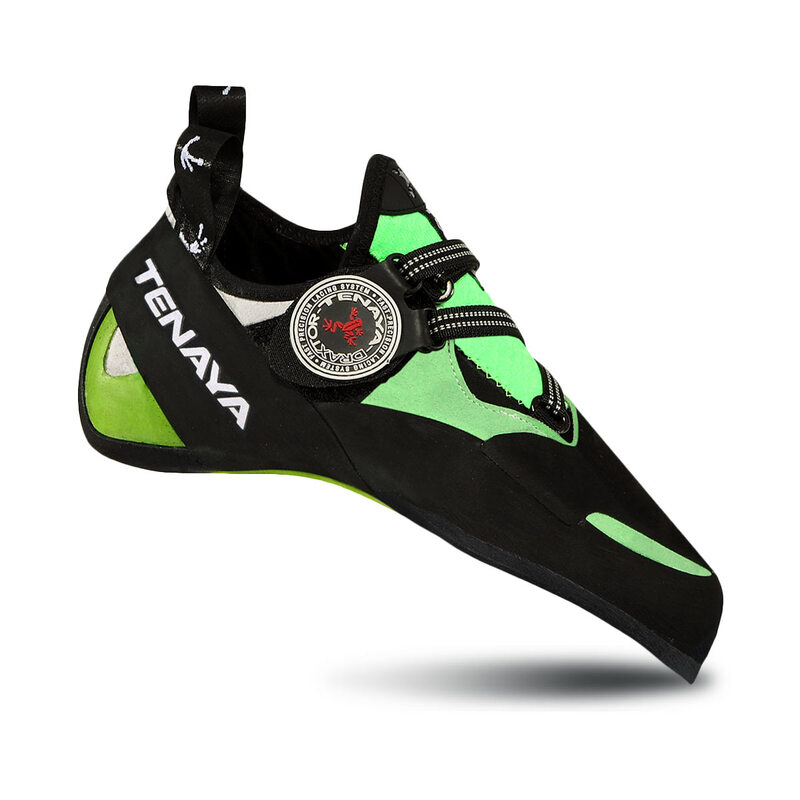 To make this shoe more durable, Tenaya have placed the Mundaka's rand over the heel rubber to prevent it from peeling off. A useful addition if you're going to be doing a lot of heel-hooking manoeuvres. As for features, the Mundaka has the easy-to-use Draxtor® lacing system with two adjustable length webbings attached to a velcro strap for fast on-and-offs and a precise fit, and the SXRDynamics® rand that prevents toe bulging and keeps the climber's weight loaded precisely on a foot hold. With a synthetic upper, the Mundaka will not stretch at all and maintain its performance shape over its entire use. An offspring of the high-performance Oasi, the Mundaka is very much the brother of the shoe that sent Alex Megos up his record breaking climb, but a slightly different design built to perform on and endure through more technical routes and problems. We recommend sizing a half size to a full size down from your normal climbing shoe size. The Mundakas are super comfortable performance shoes. I've worn these shoes for about a couple months now, have used them for mostly bouldering (indoors & outdoors), some sport climbing, and deep water soloing once--and they've been great for nearly everything. I can't overstate how comfortable these shoes are: it's really easy to forget that the shoes are on, and spend an entire gym session in them without taking them off. It's immediate too--the first time you put these shoes on, they feel great, with almost no break in time. I've had shoes that I had to take off after each burn because they were too tight/my foot had to adjust--I've never had that problem with Tenayas. They are sooo comfortable. Performance wise, I've tried up to V8s (indoors and outdoors) and 5.11/5.12s (also outdoors/indoors) in these shoes. The shoes work just as well outdoors as they do inside. They've great for toe-hooking, smearing, slab, and heel hooking. I don't think these shoes are the best shoes for edging, but I don't think they will hold you back either. They also heel-hook really well--although I've got one minor nit about the sideways heel-hooks (below). The lacing system is both really great and slightly annoying: it lets you decide precisely how tight you want the shoe... so now you can fiddle around with it endlessly. I find that I tend to leave the laces pretty loose when I'm warming up, and then adjust them so the shoes are a little more snug when I start trying hard. I've also sometimes ratcheted down the back strap a little more if I know I've got a hard heel hook coming up. Sizing-wise: I've previously climbed in the Oasis (which I also loved), and the sizing seemed to be about the same. * If you cinch the lacing system too tight too frequently, the metal rings may start to separate from/eat into the leather. I noticed a gap between the leather and the ring once when I did so. This issue may be unique to me--because after a lot of use, almost all of the shoes I've had (Miuras, Futuras, Instinct VSs, Oasis, Skwamas), the opposing metal rings have either eaten through part of the leather shoe or part of the strap. But if you're the type of person who falls off a problem, re-tightens your shoes, and then tries again (and repeats the cycle), you might need to break out of that habit with these shoes. * I was working a problem with a sharp, awkward, sideways heel hook, which somehow dug between the rubber and the heel leather, and started separating the two a little. * The neon green color really pops. Until more people see them around, you will get asked about them. I personally like the colors, but just a word of warning.